Looking for industrial high pressure underwater pumps? Look no futher! Jetech’s specialty line of industrial submersible pumps can be manufactured in sizes up to 700 horsepower. The high pressure submersible pumps have a proven track record of dives and are designed to operate in underwater depths of 10,000 plus feet. Jetech High Pressure Tiplex and Quituplex Pump Model 100J3-UW & 150J5-U. Without a doubt, JETECH® Model UW-UH Sub-sea line of triplex and quintuplex pumps represents a new era in under water pumping equipment. Engineered to function in sub-sea environments, the pumps are capable of operating up to 40,000-psi (2750 bar) dis­charge pressure. This is the only submersible PD pump of this type and pressure. 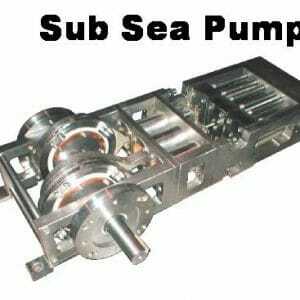 The unique design of the UW-UH pumps permit the crankcase of the pumps to be flooded by seawater and thus, have zero differential pressure between the internal and external casing of the power-end. This will allow the underwater pumps to operate in the deepest depths of the ocean. The UW-UH Pumps “DO NOT REQUIRE OIL OR GREASE” in the power-end. They are engineered to operate using seawater for cooling and lubricating the bearings and other moving components. The UW-UH pumps are well suited to be driven by a direct connected hydraulic motor. When mounted onto an ROV, thousands of dollars of expensive ultra-high pressure hose is eliminated. Depending on the operating depth, savings can ex­ceed $100,000 dollars. In addition only about 20 feet of hose is required and thus, excessive pressure drop associated with long lengths of hose is elimi­nated. This permits all pressure generated by the submersible pump to do productive work which means increased efficiency in the water jetting process. The UW-UH pumps are available in either a triplex or quintuplex configuration with a right or left-hand drive shaft. The UH version sports the time proven JETECH® “AD” Liquid-end. The pumps are made with all stainless steel construction including the power end. This permits corrosion tolerance to seawater. The main and connecting rod bearings are designed and manufactured by JETECH® and are non-metallic, IOS-3000 material. All the tie bolts are stainless steel or nickel coated to help prevent rusting and corrosion. Applications: Hydrostatic testing, Blow out preventer (BOP) testing, Methanol injection, pipeline lining/coating removal, etc.